Careful With That Axe, Eugene: Patrick Pearse - A Rare Photograph? Patrick Pearse - A Rare Photograph? Just before my Mother-in-Law, Mary Rose Bourke, died in September 2006, Roma saved some old photos and letters that Mary Rose had at home and was about to throw out. Interestingly, included were several very old letters, documents, and photos dating back to the early parts of the 20th century. Roma's grand-aunt, Eileen Ryan, was an aquaintance of Margaret Pearse - Patrick's mother. Eileen also attended Pearse's school for girls (St Ita's in Ranelagh). I'll post a few items on this blog about this as it is facinating that these documents were kept in Roma's family for over 80 years. Eileen Ryan died on 29th July 1923. Her sister (Gabrielle) was Roma's paternal grandmother. 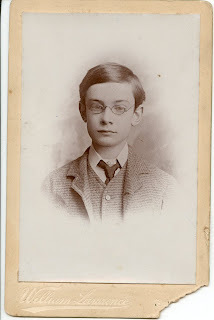 Perhaps the most interesting photograph is one of Patrick Pearse as a school boy. Pearse was born in 1879, so the picture shown to the left was probably taken in the 1890's - he looks about 12-14 years old in this photo. Ruth Dudley Edwards, in her excellent biography of Pearse "Patrick Pearse - The Triumph of Failure" shows a copy of the photograph among others in the centre section. It is simply labelled "Schoolboy" with no reference to it in the text, or in the bibliography. I suspect this is quite a valuable photo. I have been to the Pearse Museum in Rathfarnham and did not see a copy of this photo there. I have also Googled it, but have not found it. Several Pearse and 1916 memorabilia have been auctioned in the recent past (see Adam's Independence auction results). In the run up to 2016, there are sure to be many more auctions and renewed interest in early 20th century memorabilia related to 1916. I have made several efforts to contact the Pearse Museum through email and telephone. Roma feels that even though the documents might be valuable, if the museum are interested in them she would like to donate, or lend, to the museum. Today, 3rd May 2008, is the 92nd anniversary of Pearse's execution by firing squad in Kilmainham Jail. Rare, still... to live twice. my grandfather was Patrick H Pearce. The story goes, Cwas an S and pearce was given to history while the man and his son was given a new life. There are oddly many stories out there. I know what family has told. But as I dig deeper into the trueth of these stories.. I am chilled by the uncommon simularities of both named men. So, my comment is this. If patrick pearse had lived and moved to the US. And such a thing could be proven...What effect would it cause and who would hurt from it. I don't know what Pearse would have achieved in America - he failed at practically everything he did (martyrdom). See Ruth Dudley Edwards's book "The Triumph of Failure". 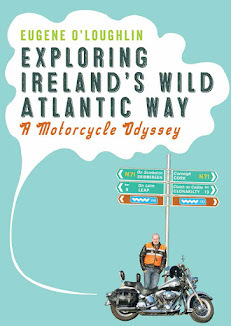 Maybe the National Library of Ireland can tell you more. Martyrdom may have come into Pearse's notions about warfare (fellow 1916 leader called him a "blithering idiot") but it had nothing to do with his or the other leaders' rationale for the 1916 Rising. They knew perfectly well that an ill-equipped body of Volunteer soldiers could not reasonably expect victory in the long-term. Their aim was to awaken a national resistance to British rule in Ireland, which is exactly what occured. Many thanks for your comment - we'll be sure to look it up. Since I published the post on May 3rd 2008 there is renewed interest withing Eileen Ryan's family in her. For example, we now know that Eileen was a lodger in the Pearse's house - hence the connection.